an instrument for measuring arterial blood pressure. Sphygmomanometer. From Lammon et al., 1995. An instrument for measuring arterial blood pressure consisting of an inflatable cuff, inflating bulb, and a gauge showing the blood pressure. /sphyg·mo·ma·nom·e·ter/ (sfig″mo-mah-nom´ĕ-ter) an instrument for measuring arterial blood pressure. An instrument for measuring blood pressure in the arteries, especially one consisting of a pressure gauge and a nylon or rubber cuff that wraps around the upper arm and inflates to constrict the arteries. an instrument for indirect measurement of blood pressure. 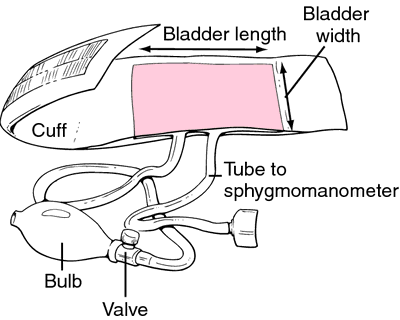 It consists of an inflatable cuff that fits around a limb, a bulb for controlling air pressure within the cuff, and a mercury or aneroid manometer. Pressure in the compressed artery is estimated by the column of mercury it balances when the cuff is inflated. See also blood pressure, manometer. Blood pressure cuff Cardiology A device used to measure arterial BP, which consists of an inflatable cuff, usually with a Velcro™ closure, a rubber inflating bulb, and a gauge to measure systolic and diastolic pressures. See Hypertension, Small cuff syndrome, White coat HTN. An instrument for measuring arterial blood pressure indirectly, consisting of an inflatable cuff, inflating bulb, and a gauge showing the blood pressure. A sphygmomanometer that allows the blood pressure to be taken without the observer's knowing where zero pressure is on the device. After the pressure is obtained, the mercury comes to rest at a point. The observed pressure is then corrected by subtracting the at-rest value on the device from the pressure obtained. Although this device was developed to prevent subjective bias in determining blood pressure, it is not necessarily effective in achieving this goal. A mercury manometer or aneroid instrument used to measure blood pressure. See KOROTKOFF SOUNDS. an instrument for measuring blood pressure. An instrument for measuring the arterial blood pressure. There are various types, the most common consisting of an inflatable cuff that is placed around the upper arm (usually the left) and air pressure within the cuff is balanced against the pressure of the blood in the brachial artery. The pressure is estimated by means of a mercury or an aneroid manometer. A stethoscope is normally used in conjunction with the instrument to listen to the blood pressure sounds (a stethoscope is not needed with an electronic sphygmomanometer). Normal systolic and diastolic blood pressures in a young adult are about 120/80, respectively. The difference between the two pressures is called the pulse pressure. Blood pressure varies with age, gender, altitude, disease, stress, fear, excitement, exercise, etc. A normal range for systolic pressure is usually considered to be 100-140 mmHg and for diastolic pressure below 90 mmHg. See arteriosclerosis; hypertension; hypertensive retinopathy. Dental instrument for measuring arterial blood pressure consisting of an inflatable cuff, inflating bulb, and a gauge showing the blood pressure. n an instrument for indirect measurement of blood pressure. See also blood pressure cuff. n a portable, handheld blood pressure measurement unit consisting of a cuff that is easily applied with one hand, a built-in or attachable stethoscope, a valve that inflates and deflates the cuff automatically, and an easy-to-read data display screen. n an instrument used to digitally measure blood pressure. The source of the mercury was an antique sphygmomanometer that was placed in the day care center as an educational toy. During the planning and execution of this study, it was reported in updated guidelines that the mercury-filled column sphygmomanometer is the gold standard for measurement of blood pressure. A comparative study of an ambulatory blood pressure measuring device and a wrist blood pressure monitor with a position sensor versus a mercury sphygmomanometer. The new gauge passes the 76-cm drop test where other sphygmomanometers fail, making DuraShock better equipped to handle ragged environments. No studies assessing this instrument have been published; however, this study was carried out to demonstrate the accuracy and any inherent bias of the F-88 by comparing it with a standard wall-mounted mercury sphygmomanometer. NO The mercury sphygmomanometer is a simple, gravity-based instrument that has been the standard for measuring blood pressure for more than 100 years. 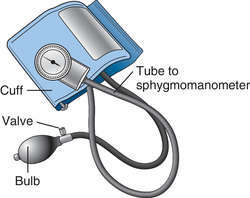 You, your doctor, or your nurse can check your blood pressure with a sphygmomanometer (SFIG-mo-man-OM-et-er ). Depending on file model, the units also feature either an Accoson Aneroid sphygmomanometer, accurate to BSEN1060-1, or an Accoson Greenlight 300 electronic sphygmomanometer. Nevertheless, patients and health care providers need to know that alternatives to the mercury sphygmomanometer can offer the same assurances of accuracy that are required for other devices, such as glucose monitors. Sphygmomanometer measurements showed no significant differences in diastolic blood pressures among infected patients and 3,267 uninfected controls. The same technology employed in weather satellites to monitor climate changes now avoids using the mercury sphygmomanometer and cuff, the old faithful mercury column doctors have relied on for nearly 100 years to measure blood pressure, but which is now being phased out because of environmental demands and EU pressure.